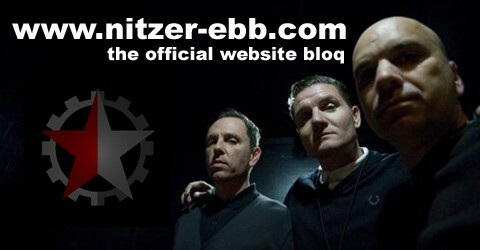 Don’t miss the chance to see Nitzer Ebb live at The Electric Ballroom on Thursday 11th March with Special Guests Client and Mechanical Cabaret! Let’s get the word out pronto!……! It’s only going to be an amazing gig if fill it to the rafters! Cheers! Douglas McCarthy and Bon Harris express their joy at engaging in the old English traditions of sausage sandwiches and tea. Jason updates you on the bands arrival in Glasgow, Scotland at the Classic Grand. The latest video diary is online here: Douglas reports back on the past few days of toil and travel…. The Nitzer Ebb Show, planned for February 24th, 2010 at the Dortmund FZW, had to be relocated to the Bochum Venue Matrix for logistical reasons. Tickets keep validity and are also available in all known advance sale places and at the Matrix Office as well. Important note to all media partners and guests which are on guest list for the NEP Dortmund Show: on account of this relocation, everyone is noted now on the guest list for the show in Bochum!